My name is Peter Kozisek. Paragliding has fascinated me for a long time and after basic course I knew flying will change my life. 3rd year after the license, I flown a total of 400 hours (in 4th 600 hours, in 5th 800 hours). Did also few competitions, usually not on the tail, despite preferring safer gliders. This blog started during a long parawaiting period and reason is just sharing my thoughts. 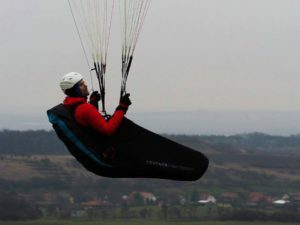 I hate marketing propaganda and if you search for honest opinion about paragliding issues, this place can provide you some, as I have no worries telling something does not work perfectly. Feel free to check my flights, and also to comment anything. Všechny zmíněné sedačky měly záložku pod zadkem a v komentářích jsi zmínil, že sedačku se záložákem na břiše (Gin Genie X-Alps) bys do svého výběru nezařadil. Jaké vidíš negativa záložky na břiše? Zajímal by mě tvůj názor.